Livinghouse can supply very wide oak floorboards that have hand distressed edges, giving an aged, but still smart looking floor. Our distressed edge wooden flooring is ideally suited to older buildings, where our antique wood flooring is judged to be too old looking. The distressed edge Oak flooring is supplied with a semi antique wax oil finish. 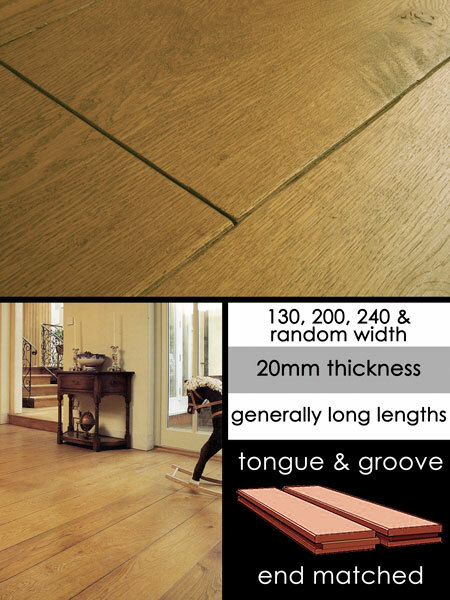 All our hardwood floor boards are tongue and grooved on all 4 edges for easy installation. All oak floors are kiln dried and supplied with the majority of the floor boards, being long lengths. * Wide board timber floor. * Hand distressed floor boards. * Semi antiqued with wax oil finish. * T & G on all edges. * Set or random width planks.